When the job calls for something heavy duty, look no further than our Heavyweight Student Uniform! Cut from super-durable 100% brushed cotton fabric and held by reinforced, double-stitched flat seams, this is one martial arts gi that will take whatever you throw at it. 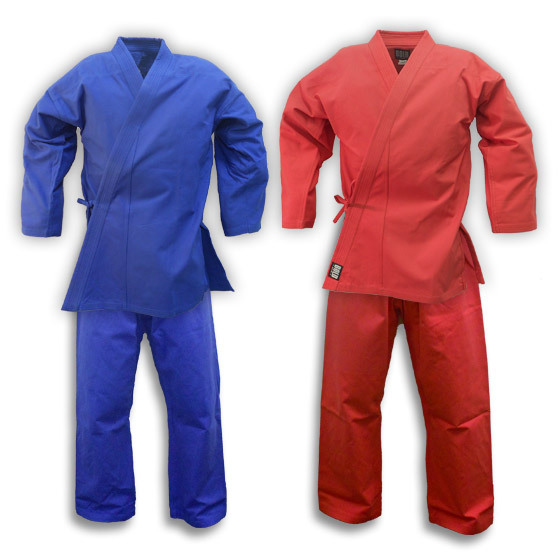 Whether you are rolling on mats or fending off sparring blows, each 2 piece set is a must have for the serious martial artist in need of more than the usual lightweight uniform. The heavyweight karate uniform even comes in your choice of two great colors! Don't ruin another middleweight uniform again. Upgrade to our Heavyweight Student Uniform and get some serious training in! It has come to our attention that, due to a factory error, some of the pants included in this set may have a label which describes the material as being a 50/50 cotton-blend. The pants themselves do in fact remain a 100% cotton material. We apologize for the inconvenience and are working with our factories to correct the mistake.